‘Team Pigment’ a group of historians and chemists from Durham and Northumbria Universities are currently analysing manuscripts from the 5th to the 15th century in order to ascertain which pigments are dyes were used in the creation of these splendid works. In a previous blog post, the reasons why ‘Team Pigment’ are researching this area were discussed. In this blog post I am to give an overview into ‘how’ pigments are analysed. Several methods can be used to identify pigments on the page, one of which is Diffuse Reflectance Spectroscopy (DRS). This method utilises the fact that visible light reflected from a sample produces an individual spectrum dependant on the nature of a sample. For example a white light shined on the blue pigment lapis lazuli will produce a spectrum as shown below on the left. This shows reflectance in the blue part of the spectrum but also some towards the red end of the spectrum. The diffuse reflectance spectrum of a different blue pigment, smalt, is shown below on the right. This spectrum again shows reflectance in the blue and red areas of the spectrum, but in a different pattern from that of lapis lazuli. In this way, and when compared to known samples, pigments in manuscripts may be discerned even when to the naked eye the samples look the same. However, diffuse reflectance has its limitations, as some pigments produce very similar spectra. Infrared spectroscopy is another tool that can be used and which works in a similar way to diffuse reflectance but in the infra-red portion of the spectrum. Yet another tool, and one which ‘Team Pigment’ are developing with high-specification and portable equipment, is Raman spectroscopy. This technique identifies vibrations in molecules to produce a Raman spectrum of bands at certain wavenumbers. When compared to library data the sample can be ascertained. Below is a manuscript from Durham Cathedral that has been examined. 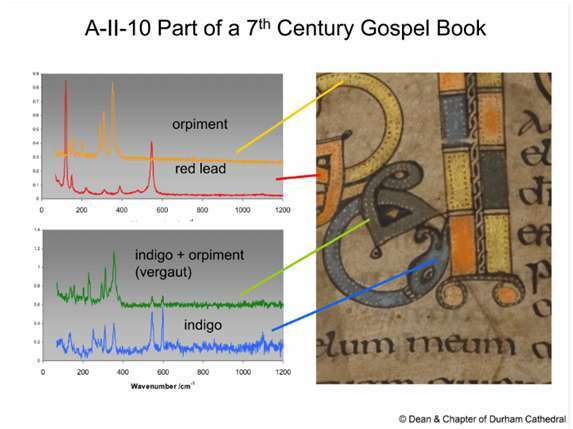 The Raman spectrum of the pigments gives us conclusive evidence about which pigments were used to decorate the page. Alongside these three techniques, multi-spectral imaging is also used. This is where light of different wavelengths are shone onto the page being examined, and a picture is taken using a filter at a specific wavelength. This can sometimes reveal under painting or writing, as well as providing further information about pigments. We can even see if anyone has sneezed on the page, as the sneeze shows as a luminous splatter in ultra-violet light!